VLOG: How to write a social media bio like a BOSS. We’re back with our second vlog where we answer questions that coaches like YOU send to AskCoachSocial@gmail.com. Natalie, one of our WHAT THE HECK TO POST members, asked this question…. I took a look at her page — and the page of 3 other folks who were asked something similar — and noticed ALL of them were being too clever with their social media bios, and not nearly clear enough. 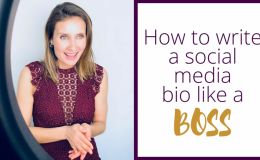 So… here’s a recipe for writing a social media bio that clearly demonstrates your value and invites people into a relationship primed for converting followers into clients. When you’re done, download these examples of ❌BAD BIOS ❌ + ✅GREAT BIOS ✅ so you can see these tips in action. 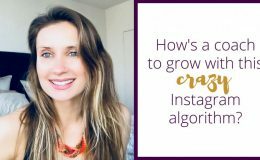 VLOG: Can’t Grow on Instagram?